The single-sided, wood burning Great Room Series is a high-tech wood burning fireplace available as zero-clearance but can be made to accommodate masonry as well. The fireplace has one set of doors. Construction of the door consist of high temperature ceramic glass, with a lifetime warranty, gasketed to a rugged 22 pound door frame. The door latching system is double-pinned (top and bottom) for a long term tight seal. The Great Room offers a 35” x 28” viewing area! It has up to 180,000 BTUs/hour, a burn time of up to 12 hours and has the capacity to heat up to 4,000 square feet! 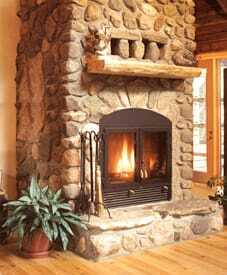 The fireplace comes standard with a 465 CFM Blower and a 14 Tube heat exchange system.